My husband’s Spiderman costume cost more than my wedding gown. Yes, my dress was simple and I bought it off the rack, but still. When he sent the first email to me about it – explaining that he was thinking of having a custom Spiderman suit made for himself for Halloween – my reaction was predictable. “You’re kidding, right?” Someone else had already reserved the Spiderman suit he rented each Halloween, and apparently there were no other quality contenders available on the Eastern Seaboard. He quoted me the seamstress’s price and quickly explained how, amortized over years and years of Halloweens, it was actually reasonable. I’m big into cost-per-use, and employ those calculations as a matter of course on every article of clothing I buy over $20. So I grumbled back an email that said, “Fine,” and I made a mental note to declare the suit his birthday gift. That was five Halloweens ago, and even at five wearings it still seemed pretty pricey. 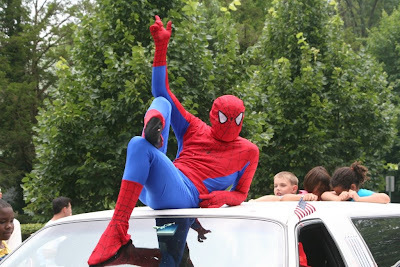 But all that changed last year, when Tom asked Scott to join him in the July 4th Parade. Tom lives two doors down, and, like Scott, is another ersatz grown-up. In a way that only someone like my comic book-collector husband would understand, Tom has an abiding passion for vintage and collectible cars. Eighteen months ago, he bought himself a 1977 white stretch Limo on eBay and announced to his wife that it was to be the new family car. She is good humored, so he was permitted to keep the car. But its main purpose in the household has never been to fetch the dry-cleaning. Instead, it’s the novelty shuttle for large groups of kids to and from soccer games or the neighborhood taxi for a spur of the moment sojourn to the ice cream store. 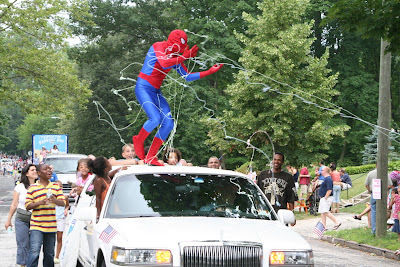 And now, it’s become a parade float for My Husband The Spiderman. It’s not a huge stretch that my husband so fully relates to Spiderman as to insist on adopting his persona year after year. His last name is Webb. He’s slim and boyish, like Spidey’s alter ego, Peter Parker. He’s yogicly nimble and has his own true version of Spidey Sense. There are simply not many middle-aged men that could pull off that costume, but he happens to be one of them. Tomorrow morning, Scott will ride his bike to yoga. He’ll come home and suit up for the parade. And somewhere around noon, while my attic-dwelling wedding dress clings wearily to its satin hanger, I’ll be on my front lawn, watching my husband squat and lunge on the roof of a white stretch limo, kids screaming to him at the tops of their lungs, and I’ll practically burst at the thought of his being able to feel like his own version of a rock star. And currently at only about $100 a pop.